Identification. São Tomé e Príncipe is the second smallest country in the Organization of African Unity. Culturally, it is a Luso-African creole nation peopled by descendants of Africans brought to work on plantations. Inhabiting two lush equatorial islands, the people of São Tomé e Príncipe are poor. Location and Geography. The Republic of São Tomé e Príncipe is composed of two inhabited islands with a total area of 385 square miles (996 square kilometers). São Tomé accounts for 330 square miles (857 square kilometers) and contains close to 95 percent of the population. São Toméisin the equatorial zone. Its strategic location in the center of the Gulf of Guinea has been an important factor in the island's history and culture. The island has served as a trading post and its strategic location was noticed by both sides during the Cold War. The topography is extremely rugged, with the exception of a small coastal plain on the northern coast where the capital and major population center, the city of São Tomé, is located. Steep hills, mountains, and ravines with narrow areas of flat terrain characterize the interior. Pico São Tomé in the west-central part of the island is the highest point. Steep hills known as morros that dominate the landscape and are heavily forested. Agriculture is labor-intensive, and the percentage of people dependent on agriculture continues to decline. The beauty of the island's tropical ecology has potential for the development of tourism. Poor communications and lack of infrastructure have kept the islands relatively isolated and undeveloped, but there has been steady growth in the number of visitors. Demography. The population of 140,000 (1999 estimate) is overwhelmingly of West African stock. It is a young population, with the majority under the age of thirty. Historically, the country has always been an agrarian society with settlements in small holdings and concentrations of laborers in widely dispersed plantations. Since independence in 1975, there has been a trend toward urbanization, with 44 percent of the population now considered urban and 60 percent of the population living near the capital, which has approximately 60,000 persons. Small towns are focal points for the religious, commercial, and administrative life of people living outside the plantations. Linguistic Affiliation. The language is a Luso-African creole derived from the languages spoken by Africans brought by the Portuguese, with a great many words from Portuguese. This language was formed in the fifteenth and sixteenth centuries when a significant number of white Portuguese resided in the country. Portuguese was widely spoken until the mid-seventeenth century, by which time most of the whites had left. Portuguese is the official language and the language of education. São Tomeans refer to their creole language as Forro, lunga santome or dialecto. A mutually intelligible dialect of Forro called ling'le is spoken on Príncipe. In the south of São Toméa refugee community of Angolan slaves speaks a dialect called lunga ngola. Since independence, children learn Portuguese at an early age. Television broadcasts in Portuguese since the mid-1980s have eroded the use of the local languages. the first twenty years of single-party Marxist-Leninist rule, internationalist Marxist symbols predominated. After multiparty democracy was introduced in 1990, the parties developed unique symbols, and several newspapers use cartoons and symbolic drawings. A wooden doll with a sliver of iron embedded in its chest and red cloth wound around its neck placed at the base of a tree constitutes a potent symbol. Emergence of the Nation. São Tomé e Príncipe was uninhabited when it was sighted by Portuguese explorers, in 1471. A succession of estate and plantation systems brought Africans from the mainland, and their descendants shaped creole culture. The emergence of the nation is linked to the roles and attitudes developed in response to the plantations and to the processes by which Africans became assimilated as free persons. The term Forro is synonymous with the national identity. The first Portuguese settlers landed in 1486 on the southwest coast. The settlement was abandoned as climate and disease took its toll, and there were no indigenous inhabitants from whom the settlers could buy food. The colonizers were unable to produce sugar or wheat, as the royal charter had urged. The king, Joao II, then gave the captaincy of the island to Alvaro de Caminha who began a settlement on the Bahia de Ana Chaves, the site of the present capital. Among the settlers were two thousand Jewish children taken from their parents and converted to Christianity. In addition to the Jewish children, there were exiled convicts and prostitutes known as degredados. The free whites were government officials, soldiers, and traders sent to exploit the West African slave, spice, and sugar trade. The royal charter directed the Jewish settlers and degredados to marry slave women and populate the island with their offspring. A second royal decree of 1515 granted free status to all African slave women given to the settlers and their offspring, and a decree in 1517 extended free status to the male African slaves of the early Jewish and convict settlers. Royal orders and actions by the king's magistrates prevented whites from trading in slaves born on the island. This created a large free black and mixed-race population that formed the nucleus of São Toméan culture. The African and European settlers transformed the island into a prosperous center of the slave and spice trades and an early sugar producer. The granting of political rights to mulattos and free blacks gave considerable power to the more prosperous free Africans, who served in the municipal council. National Identity. By the early nineteenth century, free and degredado whites had merged into a single white category. Mulattos had the rights and privileges of whites and were grouped together in the censuses. The largest group was the Forros, or free blacks. The more prosperous and politically prominent free blacks referred to themselves as filhos da terra, the descendants of the earliest settlers, to distinguish themselves from blacks who were freed in the nineteenth century. Basically all those who lived away from the plantations and could claim a small plot of land, membership in a religious brotherhood, or political patronage were considered Forros. Most of the rural population is tied to the roças, (plantations). These people are the descendants of Angolan and Mozambican contract laborers and Cape Verdians. The word tonga is a pejorative term by which some Forros refer to these people. Descendants of Cape Verdians remain a small and distinct community, many of whom still seek to migrate. The process of assimilation to the national culture is accelerating as the plantations decline in economic importance, and the social distinctions based on race that characterized the colonial period no longer exist. Ethnic Relations. Mulattos were always few in numbers and never held a high status. Under the Portuguese, they were given special privileges that ceased at independence, and they do not constitute a bloc in economic or cultural terms. They tend to assimilate to the Forro category over time. Whites are often expatriate workers on one of the many technical missions associated with development assistance. Other whites are engaged in business and are not permanent residents. The island has remained essentially African, with the closest ties and influences coming from the African mainland. Urban spaces were designed and built by the Portuguese colonial administration and include imposing cement administrative buildings, commercial houses, and the lodgings of the former colonial administrators and civil servants built in a Salazarist style known as luso-tropical. They were designed to evoke the grandeur and permanence of the Portuguese overseas empire. In the capital city and in the small towns, buildings are arranged in a centralized pattern with a Catholic church, the administrative building, postal and telecommunications offices, and a commercial house that formerly belonged to Portuguese overseas companies. Near these buildings are solid cement houses built for Europeans and now occupied by well-connected Forros. In São Tomé City, the streets follow a grid pattern. In small towns, concrete buildings are strung along the few roads that traverse the islands. Fort São Sebastião, built by the Portuguese in the sixteenth century to guard the entrance to the Bay of Ana Chaves and the port of São Tomé, houses the national museum. Indigenous architecture consists of wooden houses raised on stilts that are surrounded by small patches of garden ( kintéh ). Most people in urban or rural spaces live in these small houses. There is no coordinated plan other than the continual subdivision of house plots as families grow and access to land in urban areas decreases. A variety of shanties and shelters can be attached to these houses as households engage in petty commerce and services. Footpaths that follow the contours of the smallholdings to reach the main roads connect these large and sprawling settlements. Public buildings are rare except for Christian meetinghouses. People on plantations are housed in large cement barracks and houses known as sanzalas above which loom the spacious houses of the plantation administrators. Food in Daily Life. The cuisine is based on tropical root crops, plantains, and bananas, with fish as the most common source of protein. The vegetables that are eaten consist of gathered indigenous greens that are cooked in red palm oil. Production of these foodstuffs is inadequate as a result of the islands' history as a plantation economy. Traditional palm oil stews are the national dish. Corn is eaten as a snack food. The traditional food culture includes fruit bats and monkey meat. Asian fruits are well established, but New World fruits such as papayas and guavas are the most widespread and abundant. Citrus trees can be found in most houseyards. Since colonial times, the country's reliance on food from abroad has begun to change the food culture. Imported rice and bread made of imported wheat flour are staple foods of urban dwellers. Generally people eat a hot meal cooked before sunset. Breakfast consists of reheated food from the night before or tea and bread. People generally eat around the hearth, which in most dwellings is a separate structure made of wood or fronds. Food Customs at Ceremonial Occasions. At weddings, baptisms, and funerals, people prepare a lavish table set in the Portuguese manner with a large array of dishes that are admired by the guests. Bottled beverages grace the table setting. These occasions are marked by roasted goat, chicken, or beef among the affluent. Wealthy families also prepare the traditional luso-African-Brazilian feijoada, a rich bean stew, for Sunday lunch or for guests. Palm wine is the primary local beverage. The intermittent production of the local brewery is avidly consumed, and bottled soft drinks are a luxury. A local cane alcohol, cacharamba, is of dubious quality. Basic Economy. Agriculture and small service industries are the major sectors of the economy. Fisheries are potentially important. Fishing remains an important activity in coastal communities. As a poor island microstate, São Tomé has limited options as a result of small markets, poor infrastructure, high transportation costs, and a lack of trained personnel and entrepreneurs. The traditional pattern of seeking state patronage remains entrenched, and avoiding labor on the plantations is still a paramount concern of most people. Overseas development aid is the main source of income for the state. In this economic climate, corruption and inefficiency abound, public indebtedness is growing, and there are periodic riots over shortages. Land Tenure and Property. At independence in 1975, twenty large Portuguese roças owned 93 percent of the land. Over eleven thousand native smallholders were crowded into the remaining land with tiny holdings called glebas. Squatters moved into abandoned areas on the roças to grow native crops for subsistence and sale. In 1992, land redistribution was begun to give squatters and small farmers secure ownership of their land and make more land available to households that wanted to farm. Commercial Activities. Smallholders grow root crops, vegetables, plantains, and bananas for local consumption. Major Industries. Industry is virtually nonexistent except for a few processing plants for food, beverages, and soap. Logging has contributed to the economy but has had a negative effect on the environment. The natural beauty and relatively healthy and safe environment have potential for tourism and ecotourism. Some investment in hotels and other tourist facilities has taken place. Trade. Traditionally, the plantation economy exported cocoa and coffee and imported rice, beans, and salt fish to feed the plantation workers. Today, cocoa is the major export, accounting for over 90 percent of foreign exchange earnings. Cocoa and export crops such as coffee, coconuts, and palm kernels are still grown on the plantations. Small amounts of high-quality cocoa are exported. Major export partners are the Netherlands, Germany, and Portugal. Imports include machinery and electrical equipment, food, and petroleum products. Import partners include Portugal, France, and Angola. Classes and Castes. Descent from a Forro family that owns land in one of the small native holdings assures kin ties and the influence needed to secure state patronage. The old African creole families that figured prominently in the history of the islands in seventeenth to nineteenth centuries still control politics and resources. Achieved status through education is important but depends on patronage; it is rare for non-Forros to advance through education alone. Thrift and hard work may advance the economic status of small farmers, traders, and fishers, but their low status gives these people little access to credit. Decades of economic stagnation and the fact that most resources are funneled through the state restrict people's opportunities to achieve social and economic mobility. Workers on the plantations are the most marginal citizens in social and economic terms. Symbols of Social Stratification. On an island with no locally produced consumer goods, travel and access to the outside world are symbols of high status. Educating one's children and shopping in Lisbon or Gabon are symbols of power and status. Participation in traditional religious and dance societies is a symbol of status that is being eclipsed by the adoption of the Western consumer culture. Government. After fifteen years of rule by a Marxist party, the Movimento Libertador de São Tomé e Príncipe (MLSTP), the country became a multiparty democracy in 1990. There is an elected National Assembly headed by a prime minister, a judiciary, and a president who is the head of state. Three main parties vie for power and the ability to dispense government resources and patronage. While political expression was restricted under the former state, there is now a fervent and active political debate carried out in photocopied newspapers and broadsheets, radio and political rallies, and word of mouth. Leadership and Political Officials. There are three political parties: the MLSTP-Partido Social Democrata, the Acção Democrática Independente, and the Partido da Convergencia Democratica-Grupo de Reflexão. The political officials who seek power within and between these parties have been the same persons since 1975. Democratization has not raised the standard of living, increased the opportunities for marginalized people, or reduced corruption. Social Problems and Control. Petty theft and larceny are caused by poverty and frequent shortages of consumer goods, but violence is rare. Military Activity. The armed forces consist of a small army and a police force with six hundred members. For defense, the country previously relied on Cuban and Angolan troops; it is assumed that foreign troops are no longer present. While police forces are an important institution for social control, more commonly social control is achieved through ritual and the use of spirits. Division of Labor by Gender. São Tomé e Príncipe is a male-dominated society, although women play important roles in all major formal and informal institutions. Women have held important posts in government. For several years after independence, the president of the National Assembly and the minister of foreign affairs were women. The Relative Status of Women and Men. Women can manage their own business enterprises independently of their husbands and brothers. The market traders who sell produce and fish are all women, some of whom accumulate and manage large amounts of cash. In a household, women manage their money independently of their husbands. Marriage to a woman with land or other property does not give the husband access or control over those resources. A third of households are headed by women. Marriage. Three types of conjugal union are common: the Christian monogamous marriage, the coresidential customary union, and the visiting relationship. Christian marriage is largely confined to the educated elite and has the highest social prestige. Among members of evangelical Christian churches and the elite, formal marriage is an accepted institution, but men often maintain conjugal relations with other women and support multiple households. Most couples live in coresidential customary unions. Typically, women and men have several partners over the course of their adult lives and have children by different partners. In plantation households, marriages are less stable, with women maintaining visiting relations with a series of men. The visiting relationship is the most common form of conjugal union for poor Forro or tonga females. Polygyny is not accepted but has been known to occur in rural areas. In all forms of conjugal unions, the father and husband are expected to contribute to the expenses of the wife and child. Inheritance. Women can inherit land, and small freehold plots held by a family often were registered in the name of the senior women in the family. Kin Groups. People reckon descent bilaterally and tend to keep the property inherited from their paternal or maternal lines distinct. Following the Portuguese custom, children take their surname from the father. Descent normally can be traced back at least three to four generations. Annual family gatherings and funerals reinforce these ties. Infant Care. On average, a woman has five to seven children. Great status is attached to having children regardless of their paternity. Typically, children remain with the mother until adolescence, after which time they may begin to spend more time with the father's family. There is also coparenting in which godparents play an important role. Children often move to be raised by a parent or relative when there is an economic crisis. There is universal compulsory primary education, and children have access to schools throughout the island. For people residing on roças or in rural Forro settlements, secondary education implies sending a child to live with relatives or as a dependent in an urban family. Higher Education. There are no institutions of higher education on the islands. Many high school graduates want to receive a university education abroad, but few people can afford this. Manners and etiquette are considered important, and greeting a person and inquiring about his or her health and family is essential in social encounters. Recognizing and paying deference to the status of a person is important. Older men and women tend to be treated with great respect, particularly if they have many children and grandchildren. Entry into a person's home or garden is a privilege, and acquaintances often converse in the road or across a garden hedge rather than enter a house or yard. Religious Beliefs. Over 80 percent of the people claim to be Roman Catholic, less than 3 percent are Evangelical Christians, and 1 percent are Seventh Day Adventists. There are twelve catholic parishes and a cathedral in the capital. The roots of Catholicism go back to the fifteenth century. There is a deep and widely held set of spiritist beliefs derived from the religions of African coastal societies. These beliefs centered on the spirits of ancestors and spirits that reside in sacred places. Places containing the remains of hastily buried persons are considered dangerous, and people leave offerings to those spirits to permit them to farm nearby. Spiritist rituals often center on healing and appeasing spirits that have been forgotten or wish to return to the world of the living. Religious Practitioners. People also belong to local religious brotherhoods. There are few native priests with most being sent from Europe. Religious festivals organized around the patron saints of towns and parishes are a feature of the annual religious calendar, and people may travel from other parts of the island to attend. Religious brotherhoods and sisterhoods play an important role in organizing these ceremonies and festivals. The most important Catholic rituals are baptism and the wake, followed by a funeral mass. Other sacraments are rarely observed. Forros have a communal religious ritual called djambí in which an entire neighborhood or village gathers to drum, dance, and witness spirit possession. Individuals can seek out a ritual specialist to obtain protection from rivals, restore their health, or gain the attention of a potential lover. On the roças, ritual specialists perform healing, divination, and ritual protection. Death and the Afterlife. Forros believe that the spirits of the dead are never disconnected from the world of the living. There remains a bond that requires the living to remember and propitiate the dead. Misfortune often is attributed to spirits of the dead that have been forgotten or not propitiated. While a spirit can reach a person who has emigrated illness and misfortune, the spirit remains bound to the island and to the place where he or she died. There is a hospital in the capital city, smaller clinics on the large roças and in the towns, and health dispensaries that reach most of the population. Health facilities are inadequately staffed, and there is a chronic shortage of pharmaceuticals. Over 80 percent of the population has access to safe drinking water. Traditional herbal healers and masseurs use a combination of herbal treatments and rituals. These practitioners diagnose disease by the visible symptoms, feeling the body or examining the urine. Independence Day on 12 July commemorates independence from Portugal in 1975. It is an official holiday and the largest celebration on the islands. The Labor Day holiday is celebrated on 1 May. Support for the Arts. There is a national theater company that performs plays in Forro. It has a wide following, but limited financial support from the government restricts the number of dramas that are performed. Literature. Poetry is the most highly developed form of literary expression. Francisco Tenreiro and Alda Graça do Espiritu Santo are among the most noted published poets. Historical events are often the subject of local poetry. Tomas Ribas is among the better known writers of folktales and short stories. Graphic Arts. Pascoal Viegas Vilhete (Canarim) Almada Negreiros, and Vianna da Mota painted folk scenes with artistic and historical value. Artists today who combine traditional folk art themes with an abstract expressionist style exhibit at the Francisco Tenreiro Cultural Center or the National Museum. Performance Arts. Dance and drama are widely practiced and appreciated. Folklore pageants such as the Danço Congo and the Tchiloli are interpretations of sixteenth century Portuguese historical plays. They are performed by masked performers in colorful attire and are accompanied by drums, flutes, and dancers. Other dance forms include the pwita and the bulaweh, both of which are organized and performed by dance societies. Older, more sedate dance forms such as the ussua and socopé are performed rarely. The physical and social sciences are not supported, as there is no institution of higher education. The little research that is done is primarily in the areas of environmental science and social science studies related to economic development and social welfare projects. Expatriate scientists and São Toméans trained abroad and funded through development assistance carry out these projects. There is a national library. Ambrosio, Antonio. "Para a historia do Folclore Sao Tomense." Historia, 81: 60–88, 1985. Clarence-Smith, W. G. The Third Portuguese Empire 1825–1975: A Study in Economic Imperialism, 1985. Eyzaguirre, Pablo B. "The Ecology of Swidden Agriculture and Agrarian History in São Tomé." Cahiers d'Etudes Africaines, 26 (101–102): 113–129, 1986. ——. "The Independence of São Tomé e Príncipe and Agrarian Reform." Journal or Modern African Studies, 27 (4): 671–678, 1989. ——. "São Tomé e Príncipe." In John Middleton, ed. The Encyclopedia of Africa South of the Sahara, 1997. Ferraz, Luiz Ivens. The Creole of São Tomé, 1979. Garfield, Robert. 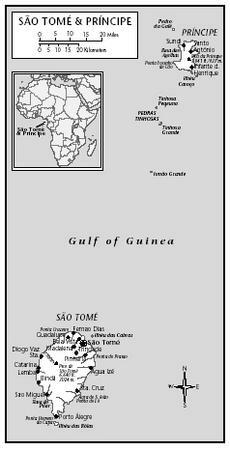 A History of São Tomé Island 1470–1655: The Key to Guinea, 1992. Hodges, Tony, and Malyn Newitt. São Tomé and Príncipe: From Plantation Colony to Microstate, 1988. Neves, Carlos Agostinho das. S. Tome e Príncipe Na Segunda Metade do Sec. XVIII, 1989. Seibert, Gerhard. Comrades, Clients and Cousins, Colonialism, Socialism and Democratization in São Tomée Príncipe, 1999. Tenreiro, Frasncisco. A Ilha de São Tomé, 1961.
this is good website, but need to tell about what resources are missing in Sao tome and principe and Overtime, what help are certified to this government? I'm portuguese with São Toméan descent. Sociologist, this was one of the most true and and interesting articles that I found about the islands. For the wonderful job made, thank you very much. I'm a brazlian/american citizen and this was one of the most true articles about sao tome and principe but i would like to know more in how to help their people and how to contact their governamental officials.Their country have lots of opportunities for real growth and development.Contact me if you have more about these islands.Pabo3663@aol.com. tclaudiomadeirahank you very much for your time and for the good article. wow i am doing a poster on Soa Tome And Principe and this has all the info i need :D it is so true but wat about thier dress? Congrats on your work. Really liked it. Probably on of the most detailed description of these beautiful Islands in which I lived for a short period. What you dont have in here is the disease that is most common or you are most likely to get. hello, i'm doing a small paper on Sao tomé, and i cant find what are the local and typical drinks. Can anyone help me on this matter ? Thank you. Hello, just read this article and i'm at the present in sao tome and i wanted to know more on how to conduct business with local people e.g. on a first meeting should i start to talk about business or should i ask about their lifes and costumes or how do they work between them and if there is a major difference when they have to work with foreigners. Thank you. Than you so much for this beautiful article, it really gives me an insight about Sao Tome. My question is: What is the situation of electricity in Sao Tome and how do they generate thier electricity? Thank you. I thought my country was unknown but I guess not this is an amazing article, I live in London but I'm from Sao Tome, well done. hello, am doing a paper on Sao tome on the Religion, geography and historical development but couldn't find the full story. can someone please help me. Hi I am from Sao Tome but was born in Mozambique was so fascinated reading abt my country .Looking for Soares family in Sao Tome both my parents are late Anastatio Bandera Soares.I am living in Zimbabwe right now but would love to meet my origins one day. Hi there, please help me to get the traditional hat for people of Sao Tome?